The newly appointed chief executive of Hong Kong SAR, Donald Tsang, had his first question-and-answer session at the Legislative Council yesterday. This photograph shows him entering the hall. 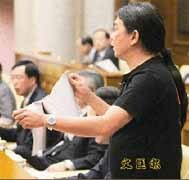 As expected, Leung Kwok-hung (aka "Long Hair") pulled another media stunt. As Donald Tsang entered, Leung stood up and raised a placard for the photographers in the gallery. 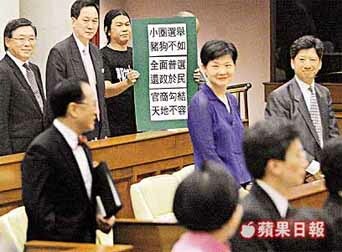 Leung would be ejected from the session by the council president after refusing to remove the sign. As a parting gesture, Leung ripped up a copy of Tsang's fourth report on constitutional reform. Leung's stunt took 25 minutes away from the question-and-answer session; no matter, since nothing important ever gets asked or answered anyway. The non-Chinese reader must be dying to know: What was written on the sign? The Legislative Council of Hong Kong meets every Wednesday afternoon in a three-story building that looks like any state capitol, with standard-issue neo-Classical dome and high columns all around. From the council's roof, a statue representing justice brandishes a sword and raises a scale into the tall shadows cast by fabulously expensive Asia-boom-era skyscrapers with designer pedigrees -- a pocket of the 19th century sandwiched amid the castles of global capitalism. The meetings of the Legislative Council, or Legco, also seem anachronistic, a surprisingly seamless blend of Asian and Western pomp and circumstance. The clang of a gong calls the bilingual sessions to order, and proceedings operate according to a precise set of rules adapted from those of the British Parliament. Upon entering or leaving the chamber, Legco members -- all except one -- bow to Rita Fan, the council president, who dominates the body from her high leather chair like a representative of the emperor (which in a way she is, since she also serves as a delegate to Beijing's rubber-stamp National People's Congress). On one Wednesday afternoon in January, all of Legco's 60 members -- except one -- arrived in their best dark suits (the women favored Chanel). Hong Kong's chief executive, Tung Chee-hwa, was about to make one of his infrequent appearances before the Legislature, to deliver his annual policy address -- a Hong Kong version of the State of the Union. A shipping tycoon's son handpicked by Beijing eight years ago (he was ''elected'' by a committee of 800 businessmen and community leaders), Tung is wildly unpopular in Hong Kong. More than half a million people marched in Hong Kong's streets on July 1, 2003, and again in 2004, demanding Tung's resignation and the right to directly elect the chief executive. Nevertheless, when Tung strode into the Legco chamber, everyone respectfully rose. As Tung took the podium, the representatives sat down. Then Long Hair turned on his heel and walked out. So the same old script has been brought back. However, the dynamic has changed. Back in January, Tung Chee-hwa was a highly unpopular figure and that would motivate his resignation in April. It might have been fair to characterize Tung as not being the popular choice of the people. But today Donald Tsang comes into office as the replacement Chief Executive and is preferred by the overwhelming majority of the people, according to public opinon polls, and no viable alternative exists. The 6.8 million people of Hong Kong do not feel cheated by his ascension. Running the same old script risks a backlash from the people. There is a difference between criticising a messed-up election system and attacking the people's choice to stop him from getting on with the business of running the government.